I start to panic if I run out of onions. They're an absolute necessity in our house. How something so pungent when raw can be so seductive when cooked is a mystery. From onion soup to the base of a thousand sauces they must be one of the most versatile ingredients we have. And yes, even raw with some cucumber, tomato and coriander they're delicious. I just tend to rinse them a little to take the edge off. 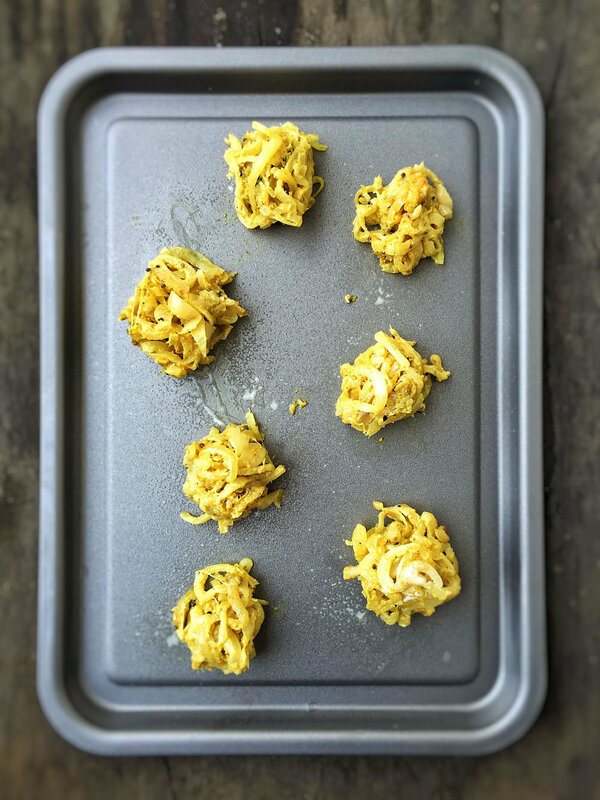 The naughtiness of a fried onion bhaji with its crisp edges and soft insides makes the onion seem illicit. I know deep-frying gets a bad press, but for me, it's more about the arse-ache of getting the fryer down and then the oil clean up afterwards that would have BP blanching. So unless I'm going all out, I bake them in the oven. They're just as delicious and yes, that little bit healthier. Two onions is enough for a small portion each. And I like to serve them with a spicy mango chilli sauce Bee's aunt Felicity brought down from Wiltshire. You can vary the spices as you like, I tend to throw a few different things in depending on my mood, but there is always ground cumin, ground coriander and ground turmeric in there. I added some ajwain and nigella seeds this time. Can you imagine?! What would the neighbours say? Method Cook the onions really slowly in some olive oil with a little salt until soft and golden. About 15 minutes. Mix them with the remaining ingredients in a bowl then divide into six to eight portions. Shape them with your hands and put on a baking tray. Cook at 180c for about 15 minutes until golden brown and crisp. Serve immediately.